This has newly mixed audio and additional footage from the Roy Firestone interview added. Plus, watching has been extended until November 15. If you haven't ordered it already, order it now! Nevessa Productions is once again providing a webcast from one of the dates on the Todd/Healing tour. This is the only webcast from the tour. It will originate from the show at the Keswick Theater in Glenside, PA on September 14th at 7:30 PM (EDT). As well as the concert performance of the complete Todd and Healing albums it will include an excerpt of his interview with Roy Firestone and some coverage of the Toddstock movie premiere and party. The price is only $19.95 (lower than the AWATS and Johnson webcasts). The subscriber will be able to see the live show plus watch it repeatedly for the following 30 days. The URL to buy tickets is easy. It's http://www.toddhealingshow.com. A Kasim Sulton solo gig is set for Sat. Oct. 23rd, 2010 at 8:00 PM at the Gateway Creamery, Joplin, Mo. to benefit the Animal Adoption and Resource Center there. Tickets will be available from the shelter's website joplinhumane.org or by contacting organizer Mark Woodin at 417 624 1069. Tickets are limited to 250 and are $25 advance. According to several sources, including the Rock and Roll Hall of Fame, Todd is the featured guest, joining the band Cream of the Crop, during an event called "Chef Jam 2010: Cleveland Food Rocks." It's set for Sunday, June 13, 2010 at 7 PM at the Rock Hall. Tickets are $50 and are available through TicketMaster. Todd brings a completely new show on the road this spring featuring many Robert Johnson classics and many other rarely performed Todd songs. This not-to-be-missed event will be broadcast live from The Ridgefield Playhouse in Ridgefield, Connecticut and available only to fans who subscribe. Todd's band will include Kasim Sulton on bass and vocals, Prairie Prince on drums and Jesse Gress on guitar. Each $24.95 webcast ticket includes 6 hours of viewing for the live event and video on demand for up to one month. The webcast will be available in a 400k stream for those with slower machines or connections and an 800k stream for near HD quality. You can switch easily between the streams to see which works best for you. Our 24/7 customer support can assist you with any connection issues. Click here to purchase your webcast ticket. The webcast is produced by Nevessa Production Woodstock. If you have further questions please contact us at events@nevessa.com. Todd Rundgren, the legendary rock musician and record producer, who has worked with everyone from Patti Smith, Meatloaf and the New York Dolls, today announced that his February 2010 London and Amsterdam "A Wizard A True Star" concerts will be released on USB stick. The European AWATS concerts will take place at the HMV London Hammersmith Apollo on Saturday 6th February, followed by the Paradiso, Amsterdam on Monday 8th February. Fans who attend the concerts will be able to buy the entire two hour concert on USB stick at the merchandise stand directly after the shows. The USB stick will include two hours of live performance audio, including "Todd Rundgren's Johnson"; a 45-minute set of Rundgren performing Robert Johnson songs, followed by a 75-minute set of the highly anticipated "A Wizard A True Star" album performed in it's entirety. The Rundgren "Wizard" USB concert sticks are the brainchild of Cologne-based live recording entertainment company Concert Online whose live recording concert USB stick roster includes KISS, Simply Red, Madness, Foreigner and Simple Minds. The all-star line-up for the European AWATS gigs includes former Utopia band members Ralph Schuckett (keyboards, vocals) and Kasim Sulton (bass, vocals), plus former Cars member Greg Hawkes (keyboards, vocals), Jesse Gress (guitar, vocals), Bobby Strickland (saxophone, vocals) and Tubes drummer Prairie Prince. Tel. 0207 272 7772, peter@noblepr.co.uk, will@noblepr.co.uk. Rundgren Radio has announced that "A Wizard, A True Star" will be performed live in California at four locations in December 2009. Todd Rundgren - rock'n'roll icon, guitarist, interactive progenitor, singer/songwriter and record producer, will perform his paradigm shifting 1973 album, A Wizard, a True Star in its entirety for the first time ever in Britain on Saturday 6th February 2010 at the London HMV Hammersmith Apollo. This marks Todd's only UK performance of the album which is hailed as an influential masterpiece by many of today's new bands, including Hot Chip. Tickets for the concert go on sale at 9am on Wednesday May 27th. Tickets are priced £48.50, £45.00, £40.00, £32.00 (Agency and credit card bookings subject to a fee). Ticket Hotline: 08700 603 777, Book Online: www.seetickets.com. Although Rundgren's breakthrough 1972 album, Something/Anything? is considered by many to be his masterpiece, the psychedelic impact and bordering-on-disturbing innovation of the follow-up, A Wizard, A True Star is arguably Rundgren's most experimental and influential album and is regarded as one of the most pioneering progressive rock albums of all time. This will be the first time in Britain that he will perform the whole record live onstage, from start to finish. The first half of the concert will feature a selection of Rundgren's songs throughout his career, while the second half will consist of the entirety of A Wizard, a True Star. Originally released in 1973, much of the album is an extended medley after the fashion of The Beatles' late recordings. The effect of the songs merging one into another was immediate, infectious and dazzling; the lyrical content was often at once both tongue in cheek and hallucinogenic. For interview opportunities, please contact Peter Noble and Will Taylor at Noble PR Consultancy Ltd. 0207 272 7772, peter@noblepr.co.uk, will@noblepr.co.uk. 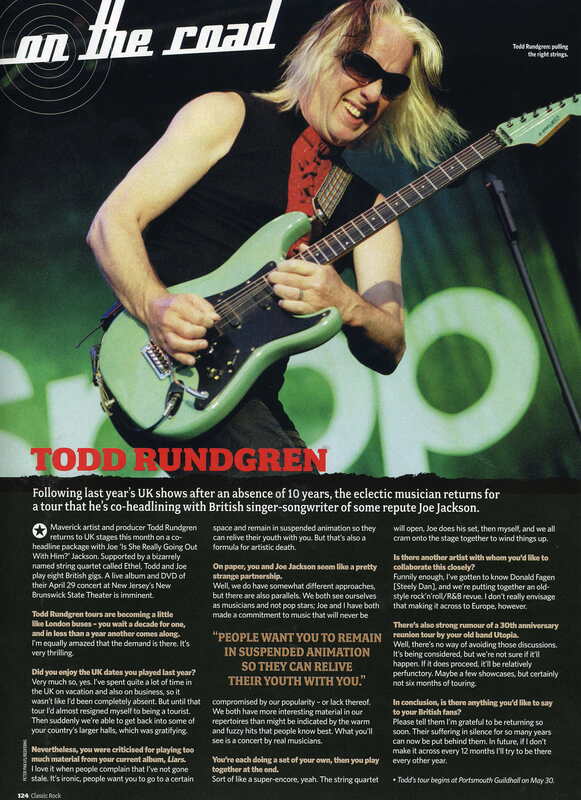 A full page colour interview with Todd Rundgren hit the UK newsstands Friday in the June 2005 edition of Classic Rock magazine. Todd mania continues to sweep the UK. Please note, there is a lot of media interest in Liverpool for Todd, as the latter cites the Beatles as a major influence on his music. Critically acclaimed classical string quartet, ETHEL, are special guests of Joe Jackson and Todd Rundgren on a massive full-scale 2005 US and European Tour. The European tour starts on May 30th at the Portsmouth Guildhall (UK) and will also include concerts in Bristol, York, Gateshead, London, Leicester, Edinburgh and Liverpool. In June Ethel the tour will continue with shows in Holland, France, Belgium, Germany, Switzerland, Italy and Spain. 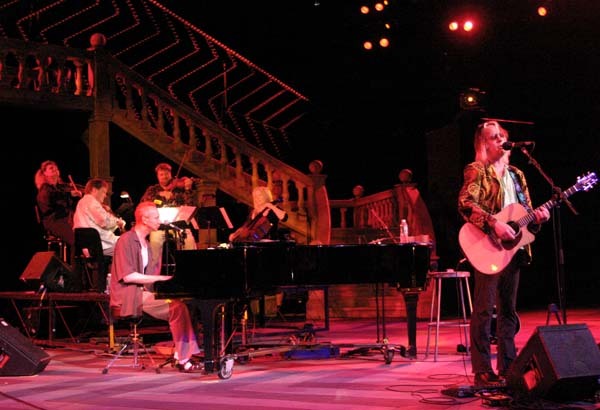 Ethel is a 21st-century realisation of the classical string quartet model featuring uptown and downtown performing stalwarts Ralph Farris, Dorothy Lawson, Todd Reynolds, and Mary Rowell. Their credentials read like a who's who of classical, contemporary, and popular music. From the Orpheus Chamber Orchestra and the Steve Reich Ensemble to the Sheryl Crow Band and the Roger Daltrey Band, Ethel brings together a vast spectrum of performing and recording experiences. They have performed on Joe Jackson's "Night and Day II" album, and Todd Rundgren wrote a piece of music for them in 2000. Unencumbered by convention, genre or style, the tastes, talents and experiences of these four musicians come together to create a flexible entity that is committed to exploring new possibilities in string quartet performance. Their debut album has been critically acclaimed by John L.Walters of the Guardian newspaper. "I wish there were more rock bands that played like Ethel," says Walters. "What you get from Ethel is the sense of the performers participating in the act of making a living, breathing music that brings the format back into contemporary life and culture while remaining an acoustic string quartet." Joe Jackson and Todd Rundgren today announced details of their forthcoming UK and European Tour. The internationally renown-recording artists and singer/songwriters will undertake a joint solo tour where they will be backed by US string quartet, Ethel. Tickets go on sale Friday March 11 at 9am for the following 8 UK concerts: Portsmouth Guild Hall (Monday May 30), Bristol Colston Hall (Tuesday May 31), York Opera House (June 2), Leicester De Montfort Hall (Friday June 3), Carling Apollo Hammersmith, London (Sunday June 5), Newcastle The Sage (Monday June 6), Edinburgh Usher Hall (Wednesday June 8) + Liverpool Philharmonic Hall (Thursday June 9). Todd, Joe and Ethel will also be performing concerts in Holland, France, Belgium, Germany, Switzerland, Italy, and Spain. The above listed press release web page/link will be refreshed daily with the latest tour developments. Classic Rock will be running a feature on the Promowest Pavilion show in Columbus, OH (April 14) and is soliciting high-quality photos for publication in the piece. If you have some good shots to consider, please contact me . Do not send the photos themselves, just let me know what you've got. The photos must be 300dpi resolution and at least 1000x1000 pixels in size. Reviews and pictures posted frequently during the course of the 2002 Abbey Road & Hall and Oates tours and solo shows. Reviews and pictures posted frequently during the course of the tour. Power Trio Tour kicked off May 24 in Santa Cruz, CA. Todd's New Year's Eve show was in Hawaii. Set list and review by Mike. Nick Szasz has a collection of photos from the 1996 solo tour in Japan. Summer 1996 saw a mini-tour on the US east coast. Here's a shot at the Sands in Atlantic City from Greg Loveria. Craig Schneider has a number of great photos from the Cleveland and Columbus shows, including Todd's famous "Hamster Smoothie" from the December 28, 1996 Columbus OH (Newport Music Hall) show. Ron Hromoko traveled from California to Altantic City to get these shots from the Invididualist Tour - Part II in Atlantic City. Lion Keezer's 7th Heaven in '97 site for the 1996-1997 New Year's celebration. And here are a few pictures from Kurt Scheinpflug of the Santa Cruz, Palo Alto, Detroit and San Francisco shows. Mike Eiseman has "enhanced" a photo from the Fillmore. Scott F. Kenward submitted these photos from the July 29, 1995 concert at the Coliseum in St. Petersburg, FL. Nancy Mearkle has a tour photo from the Cleveland show. TR and crew made a few year-end appearances, including Chicago on New Year's Eve 1995/96. Check out the action courtesy of Lion Keezer! This is the ultimate concert review and should not be missed!